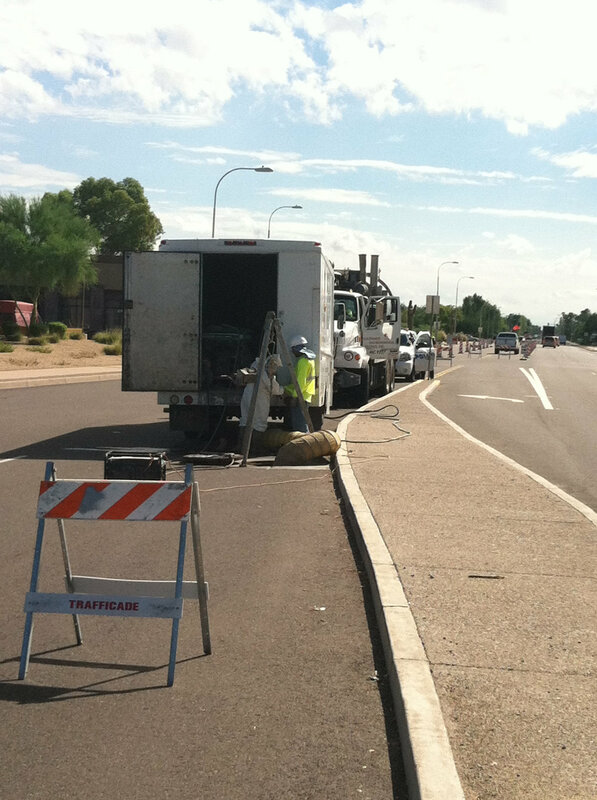 The work performed under this contract involved the rehabilitation of 54 sewer manhole structures located on Frye Road between Alma School Road and Price Road in Chandler. One additional manhole rehabilitation was located on the east side of Price Road south of the Loop 202 Santan Freeway and required the temporary bypassing of a 66” gravity sewer interceptor flowing at 25 million gallons per day. The rehabilitation methods required for the project included both an Epoxy Coating System and a Fiberglass Reinforced Polyester Lining System. We teamed with both Southwest Environmental Testing, Inc. (SWET) and L.F. Manufacturing (LFM) to restore structural integrity to the deteriorated manholes. SWET is a Certified Applicator of Raven Lining Systems, an ultra-high-build sprayable epoxy product proven to provide excellent chemical resistance and adhesion to underground concrete substrates and formulated for structural renewal of severely deteriorated wastewater infrastructure. LFM is a manufacturer of high-quality fiberglass reinforced plastic manhole liners engineered to provide strong, long lasting, corrosion-free structures not affected by common wastewater gases.